A traditionally quiet week after the busy holiday sales period, with Christmas being included in the week, sales generally are a bit weaker, and so are the new releases. The Mountain Between Us was the top selling new release, but it only managed to get to 6th place on the Blu-ray sales chart. There were 4 more new releases in the top 20 though, but those other ones sold even less copies. Jeepers Creepers III got as high as 13th, while in 14th, it was the 2017 remake of Flatliners. Brawl in Cell Block 99 was in 19th. 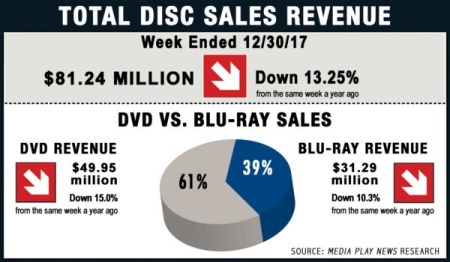 Comparing this last week of 2017 with the last week of 2016, DVD revenue was down 15% whereas Blu-ray revenue was down 10%. Not as bad as last week, but the downward trend is still pretty clear to see. This week's Ultra HD Blu-ray report: Out of the four new releases listed above, two, 'The Mountain Between Us' and 'Brawl in Cell Block 99' were made available on UHD. So out of the top 10, nine titles all had UHD editions. None of the new releases got over the magic 50% BD sales mark, meaning their DVD editions sold more copies than their Blu-ray editions. 'The Mountain Between Us' had the best BD sales share of all the new releases, with 48%, followed by 'Brawl in Cell Block 99' with 46%, 'Flatliners' with 44% and 'Jeepers Creepers III' with 33%. Of the releases with UHD editions, 'Brawl in Cell Block 99' got 7.26% while 'The Mountain Between Us' managed 4%. The stats for the week ending December 31, 2016 are as follows. Some small adjustments to the data posted last year (based on more recent updates) has been made and is shown below. An "all red" week narrowly avoided by rising Blu-ray market share (or otherwise explained as Blu-ray revenue declining at a slightly lower rate than DVD revenue). Blu-ray sales decreased by $3.59m (down 10.3%), while DVD sales decreased by $8.81m (down 15%) producing $12.40 million less in combined revenue. Blu-ray's market share increased from 37.25% to 38.52%. The first week of the year is here, and again, a traditionally quiet week. As a result, there was only one new release, although it did manage to find its way to the top of the charts. American Made easily outsold everything else, including the recent top seller 'Dunkirk'. Weekly Blu-ray revenue was dangerously close to falling behind $20 million for the first time in a long time. This week's Ultra HD Blu-ray report: 'American Made' was released on UHD. So out of the top 10, nine titles all had UHD editions. 'American Made' got a first week BD sales share of 60.88%, which is more than respectable. It also had a very healthy UHD sales share of 12.09%! The stats for the week ending January 7, 2017 are as follows. Some small adjustments to the data posted last year (based on more recent updates) has been made and is shown below. Blu-ray sales decreased by $3.11m (down 12.4%), while DVD sales decreased by $12.21m (down 23.4%) producing $15.32 million less in combined revenue. Blu-ray's market share increased from 32.47% to 35.48%. An A-list release in the form of It helped Blu-ray revenue recover and weekly Blu-ray market share reach above 40%. Two other new releases occupying the second and third spots also helped, with My Little Pony: The Movie in second and The Foreigner in third. Outside of the top 10, there was one more new release, Marshall in 12th. Friend Request came 18th on the combined Blu-ray and DVD chart, but did not get into the Blu-ray top 20. This week's Ultra HD Blu-ray report: Of this week's previously mentioned new releases, only 'It' was made available on UHD. So out of the top 10, seven titles all had UHD editions. As a new feature to this analysis, a new graphic has been added above using information provided by NPD (which differs from the other data here, gathered by Media Play News Research). It shows that UHD sales share was at 6.8% for this week. 'It' had a first week sales share of 62.15%, while 'My Little Pony: The Movie' managed 53.04%, just ahead of the 52.52% by 'The Foreigner'. 'Marshall' was also close, with 52.47%. 'It' managed a UHD sales share of 11.68%. The stats for the week ending January 14, 2017 are as follows. Some small adjustments to the data posted last year (based on more recent updates) has been made and is shown below. Blu-ray sales increased by $1.25m (up 4.7%), while DVD sales decreased by $7.94m (down 16.2%) producing $6.69 million less in combined revenue. Blu-ray's market share increased from 35.22% to 40.45%. Weekly Blu-ray market share remained above 40% thanks to a slew of new releases in the top 20. The best selling of which was Blade Runner 2049, easily outselling last week's number one 'It'. Happy Death Day was in 3rd place, while The Snowman was in 6th. Outside of the top 20, Beyond Skyline was in 13th while Loving Vincent was in 17th. Gangster Land got as high as 14th on the combined Blu-ray and DVD chart, but failed to make the Blu-ray top 20. This week's Ultra HD Blu-ray report: Of this week's many new releases, only one, 'Blade Runner 2049' was available on UHD. So out of the top 10, six titles had UHD editions. Data provided by NPD (see graphics above) shows that UHD sales share was at 9.1% for this week (data gathered by the NPD differs from the other data here and is only for the top 50 best selling titles. The other data here are gathered by Media Play News Research) . 'Blade Runner 2049' had the highest BD sales share for the week, with an impressive 76.03%. A "Best Buy" exclusive 3D edition of the film was also available and it had a 3D sales share of 1.97%. Its UHD sales share was equally impressive at 22.88%. 'Happy Death Day' had BD sales share of 53.64%, while 'The Snowman' managed 51.33%. The other new releases didn't get into the BD sales share top 20, but 'Loving Vincent' managed 42%, 'Beyond Skyline' got 38% and 'Gangster Land' got 30%. The stats for the week ending January 21, 2017 are as follows. Some small adjustments to the data posted last year (based on more recent updates) has been made and is shown below. Blu-ray sales increased by $3.1m (up 13.5%), while DVD sales decreased by $8.39m (down 18.1%) producing $5.29 million less in combined revenue. 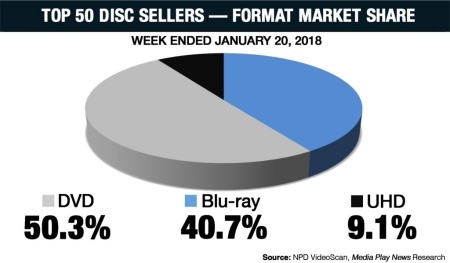 Blu-ray's market share increased from 33.12% to 40.70%. Coming Soon: Also keep an eye out for our annual "Blu-ray: The State of Play" report summarising the performance of Blu-ray, DVD and now Ultra HD in 2017. 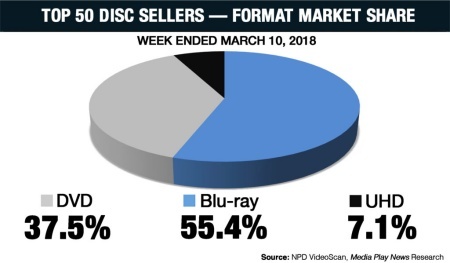 Blu-ray and DVD revenue both saw declines, with Blu-ray weekly market share also dropping back compared to recent weeks, "thanks" largely to this week's lackluster release slate. Geostorm was the week's top selling new release, but it failed to beat both 'Blade Runner 2049' and 'Dunkirk' to the top two spots. Jigsaw wasn't too far behind in 4th place. Then it's all the way down to 13th place for the next new release, Thank You for Your Service. And that was it in terms of new releases. This week's Ultra HD Blu-ray report: Of this week's new releases, only one, 'Jigsaw' was available on UHD. A couple of recent big releases made a return to the top 10, and as most of these had UHD editions, it was almost a clean sweep on this front. So out of the top 10, nine titles had UHD editions. Data provided by NPD (see graphics above) shows that UHD sales share was at 5.7% for this week (data gathered by the NPD differs from the other data here and is only for the top 50 best selling titles. The other data here are gathered by Media Play News Research) . 'Jigsaw' actually saw a higher BD sales share than 'Geostorm', but only just, 52% compared to 51%. 'Geostorm' also had a 3D edition, but it was a case of "why did they even bother", as the 3D edition had a 3D sales share of 0.1% (or to put it in other words, out of every 1000 copies of 'Geostorm' sold, only one copy was for the 3D edition). 'Thank You for Your Service' had a BD sales share of 49%. 'Jigsaw' did well on UHD, scoring a first week UHD sales share of 7.10%. The stats for the week ending January 28, 2017 are as follows. Some small adjustments to the data posted last year (based on more recent updates) has been made and is shown below. 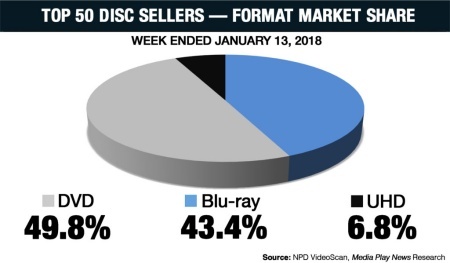 An 'all red week' saved by rising Blu-ray market share (basically meaning that DVD revenue dropped faster than Blu-ray revenue). Blu-ray sales decreased by $2.33m (down 9.2%), while DVD sales decreased by $11.72m (down 24.6%) producing $14.05 million less in combined revenue. Blu-ray's market share increased from 34.75% to 39.08%. It's a very quiet week for Blu-ray, so quiet that weekly Blu-ray revenue fell below $20 million for the first time in a while. But to be fair, this is usually a quiet time in terms of new releases, and therefore, sales. The best selling new release for this week was Boo 2! A Madea Halloween, which managed to only get second place, behind 'Blade Runner 2049'. The only other new release in the top 20 was Rendel: Dark Vengeance in 9th place. This week's Ultra HD Blu-ray report: Neither of these week's 2 new releases in the top 20 were available on UHD. So out of the top 10, seven titles had UHD editions. Data provided by NPD (see graphics above) shows that UHD sales share was at 3.6% for this week (data gathered by the NPD differs from the other data here and is only for the top 50 best selling titles. The other data here are gathered by Media Play News Research) . Neither of the two new releases in the top 20 this week made the BD sales share top 20. 'Rendel: Dark Vengeance' actually had the better of the BD sales share, with 31%, compared to 'Boo 2! A Madea Halloween', which managed only 24%. The stats for the week ending February 4, 2017 are as follows. Some small adjustments to the data posted last year (based on more recent updates) has been made and is shown below. An 'all red week'. While this time last year also saw a 'Madea' movie, it was not the best seller like it was this year - it was beaten by 'Jack Reacher: Never Go Back' and a new edition of 'Pinocchio', both bigger releases than your typical Madea movie. Blu-ray sales decreased by $8.35m (down 31.2%), while DVD sales decreased by $13.8m (down 26.7%) producing $22.15 million less in combined revenue. Blu-ray's market share decreased from 34.12% to 32.71%. A lot of new releases, but none were what you would call an "A-List" release, which meant that while weekly Blu-ray revenue rose compared to the previous week's lows, it didn't rise by much. The best selling of the new releases, and also this week's top seller overall was A Bad Moms Christmas, followed closely in second place by Batman: Gotham by Gaslight. Only the Brave was in a slightly more distant third place. In 10th place was Victor Crowley, which was just ahead of 24 Hours to Live in 11th. In 13th place was Suburbicon, while the 20th place was also occupied by a new release, The Stray. This week's Ultra HD Blu-ray report: Despite the large number of new releases, only one of these, 'Batman: Gotham by Gaslight', had a UHD version. So out of the top 10, only five titles had UHD editions. Data provided by NPD (see graphics above) shows that UHD sales share was at 2.6% for this week (data gathered by the NPD differs from the other data here and is only for the top 50 best selling titles. The other data here are gathered by Media Play News Research) . 'Victor Crowley' had the best BD sales share of all titles this week, with 97.36%. 'Batman: Gotham by Gaslight' also did well on Blu-ray with 75.03%, and it had a UHD sales share of 6.52%. 'Suburbicon' managed 62%, while 'A Bad Moms Christmas' got 51.5%. The stats for the week ending February 11, 2017 are as follows. Some small adjustments to the data posted last year (based on more recent updates) has been made and is shown below. An 'all red week' as 'A Bad Moms Christmas' lost out to 'Trolls' from this week last year. Blu-ray sales decreased by $12.48m (down 36.8%), while DVD sales decreased by $18.21m (down 31%) producing $30.69 million less in combined revenue. Blu-ray's market share decreased from 36.61% to 34.60%. 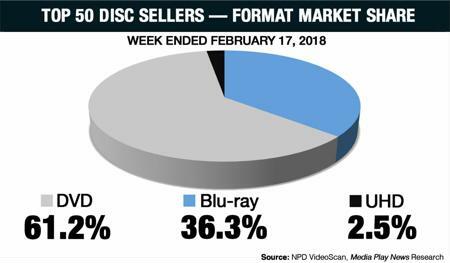 Blu-ray revenue improved a bit this week compared to last week, as the release slate still looks fairly thin despite the quantity of releases in the top 20. The best selling of the new releases, and also this week's top seller, was Wonder, easily outselling last week's number one 'A Bad Moms Christmas'. The next new release was all the way down in 7th place, and it was the Criterion edition of the original 1968 Night of the Living Dead. The other new releases were all outside of the top 10. Roman J. Israel, Esq. ended up in 12th place, with Blade of the Immortal in 16th and another Criterion release, this time for The Silence of the Lambs, in 17th. This week's Ultra HD Blu-ray report: Despite the large number of new releases, only one of these had a UHD version. So out of the top 10, seven titles had UHD editions. Data provided by NPD (see graphics above) shows that UHD sales share was at 2.6% for this week (data gathered by the NPD differs from the other data here and is only for the top 50 best selling titles. The other data here are gathered by Media Play News Research) . Being a re-release, it wasn't a surprise to find that 'Night of the Living Dead' had a BD sales share of 97.11%. 'Blade of the Immortal' had the next highest BD sales share with 72.04%. 'Wonder' managed 46%, while 'Roman J. Israel, Esq.' was closely behind with 45%. As mentioned earlier, 'Wonder' was also available on UHD, and it had a UHD sales share of 2.00%. The stats for the week ending February 18, 2017 are as follows. Some small adjustments to the data posted last year (based on more recent updates) has been made and is shown below. An 'all red week' narrowly avoided thanks to rising weekly Blu-ray market share. Blu-ray sales decreased by $5.84m (down 18.7%), while DVD sales decreased by $12.79m (down 22%) producing $18.63 million less in combined revenue. Blu-ray's market share increased from 34.96% to 35.91%. Blu-ray revenue remained virtually unchanged from the previous week, although with DVD revenue rising a little, it meant that weekly Blu-ray market share dropped. It again wasn't a week with tons of big releases, but the biggest new release, Daddy's Home 2, did become the week's overall top seller. The two movie pack, Daddy’s Home 2-Movie Collection, was also in the top 10 at 10th. The Star was in 3rd place, and then it was all the way down to 9th for the next new release, Dragon Ball Super: Part 3. Mom and Dad finished in 12th, and was the only other new release in the top 20. This week's Ultra HD Blu-ray report: Only one of this week's previously mentioned new releases had a UHD version, and that was 'Daddy's Home 2'. So out of the top 10, six titles had UHD editions. Data provided by NPD (see graphics above) shows that UHD sales share was at 2.2% for this week (data gathered by the NPD differs from the other data here and is only for the top 50 best selling titles. The other data here are gathered by Media Play News Research). Of this week's new releases (in the top 20), 'Dragon Ball Super: Part 3' had the best BD sales share with 68.93%. 'Daddy’s Home' managed to get over the 50% mark with 52.63%, and a UHD sales share of 3.98%. The two movie pack got 39.40%. 'The Star' got 46.35%, while 'Mom and Dad' managed 39.91%. The stats for the week ending February 25, 2017 are as follows. Some small adjustments to the data posted last year (based on more recent updates) has been made and is shown below. An 'all red week' that wasn't avoided, but only by the smallest margins (0.09% weekly Blu-ray market share). Blu-ray sales decreased by $6.03m (down 19.4%), with unit sales down 18.9%. DVD sales decreased by $13.14m (down 21.2%), with unit sales down 18.4%. This meant $18.63 million less in combined revenue for the week. Blu-ray's market share decreased from 33.40% to 33.91%. Blu-ray revenue nearly doubled compared to the previous week, all thanks to a major release in the form of Pixar's Coco. It was easily the week's top seller, selling more than 7 times the number of copies of the second placed, and also newly released, Murder on the Orient Express. Another Disney best seller arrived in the form of the Blu-ray exclusive Lady and the Tramp: Signature Collection, which finished 3rd. Oscar favourite Darkest Hour was 4th, making all of the top 4 new releases, while another Oscar favourite Three Billboards Outside Ebbing, Missouri finished in 6th, just behind last week's number one 'Daddy’s Home 2'. There are more new releases outside of the top 10, making this week one helluva week in terms of new stuff. Attack on Titan: Season 2 lands in the Blu-ray charts at 11, while in 17 and 18 we have Hangman and Let There Be Light. And missing out of the Blu-ray top 20, but in the combined Blu-ray and DVD charts at 20th was Just Getting Started. This week's Ultra HD Blu-ray report: Three out of this week's, I don't know how many, I guess 9 previously mentioned new releases, had UHD editions, including 'Coco', 'Murder on the Orient Express' and 'Three Billboards Outside Ebbing, Missouri'. So out of the top 10, six titles had UHD editions. Data provided by NPD (see graphics above) shows that UHD sales share was at 3.7% for this week (data gathered by the NPD differs from the other data here and is only for the top 50 best selling titles. The other data here are gathered by Media Play News Research). 'Coco' had the best BD sales share of all the new releases, with 71.79%. 'Darkest Hour' was the next best with 63.53%. 'Three Billboards Outside Ebbing, Missouri' managed 57.73%, while 'Murder on the Orient Express' wasn't too far behind at 55.28%. 'Hangman' managed 33.34% while 'Just Getting Started' got 30.51%. 'Let There Be Light' got 27%. The stats for the week ending March 4, 2017 are as follows. Some small adjustments to the data posted last year (based on more recent updates) has been made and is shown below. This time last year it was the week when 'Doctor Strange' was released, but 'Coco' et al. were better sellers on Blu-ray this week. 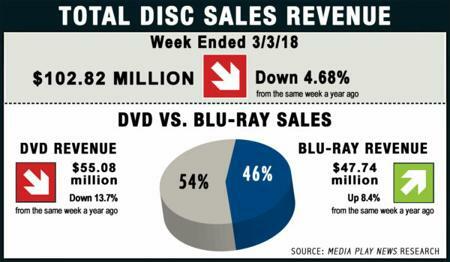 Unfortunately, DVD sales continue to slide at a faster pace than Blu-ray grew this week. Blu-ray sales increased by $3.7m (up 8.4%), with unit sales up 7%. DVD sales decreased by $8.74m (down 13.7%), with unit sales down 12.4%. This meant $5.04 million less in combined revenue for the week. Blu-ray's market share increased from 40.83% to 46.43%. The week ending March 10 is the biggest week of the year so far in terms of Blu-ray sales, thanks largely to the release of Thor: Ragnarok - it outsold last week's number one, 'Coco', by more than a 3-to-1 margin. 'CoCo' is still selling well, and this helped to contribute to the high Blu-ray sales figure, approaching almost $60 million, and for the first time in a while, higher than that for DVDs. It wasn't the only new release for the week though, as there were three others in the top 10 alone. in 8th was Lady Bird, followed by the re-release of The Dark Crystal as the 'Anniversary Edition'. And in 10th, it was Blue Planet II. Outside of the top 10, we had NFL Super Bowl LII Champions: Philadelphia Eagles in 14th, The Man Who Invented Christmas in 18th and Fairy Tail: Dragon Cry in 19th. This week's Ultra HD Blu-ray report: Three out of this week's previously mentioned new releases had UHD editions, and two did particularly well on UHD (more on that below). The three titles were 'Thor: Ragnarok', 'Blue Planet II', and 'The Dark Crystal: Anniversary Edition'. So out of the top 10, six titles had UHD editions. Data provided by NPD (see graphics above) shows that UHD sales share was at 7.1% for this week, which is almost double that of last week (data gathered by the NPD differs from the other data here and is only for the top 50 best selling titles. The other data here are gathered by Media Play News Research). 'Blue Planet II' also got a high BD sales share, 74.71%, which is not surprising considering how the content benefits from the enhanced quality of Blu-ray. By the same argument, the UHD edition of 'Blue Planet II' should have been a best seller, and it was, garnering an impressive 46.37% UHD sales share. The new edition of 'The Dark Crystal', which was not available on DVD, also had a great UHD sales share of 36.47%. 'NFL Super Bowl LII Champions: Philadelphia Eagles' got an impressive 73.95%, showing that NFL fans are also abandoning the DVD format in alarming numbers. 'Lady Bird' got 54.92%, while 'The Man Who Invented Christmas' managed 45.97%. The stats for the week ending March 11, 2017 are as follows. Some small adjustments to the data posted last year (based on more recent updates) has been made and is shown below. This time last year 'Moana' was the best seller for the week, but it was the only new release in the top 10. By all calculations, it seems 'Thor: Ragnarok' was a much bigger release than 'Moana'. Blu-ray sales increased by $3.3m (up 6.2%), with unit sales up 3.2%. DVD sales decreased by $13.5m (down 20.0%), with unit sales down 16.4%. This meant $10.2 million less in combined revenue for the week. Blu-ray's market share increased from 44.51% to 51.55%. Blu-ray sales continued its recent good run and even improved upon last week's result, which was also the best so far this year. The title largely responsible for this is Justice League, which soared to the top of the sales charts with ease, selling more than twice as many copies as last week's (also superhero inspired) number one, 'Thor: Ragnarok'. Third place was also occupied by a new release in the form of Ferdinand. Then it's down to 5th, 6th and 7th for the next block of new releases, Oscar Best Picture winner The Shape of Water, Call Me By Your Name and I, Tonya. And finally, in 10th spot, The Disaster Artist was the last of the new releases in the top 20. This week's Ultra HD Blu-ray report: Again, three out of this week's previously mentioned new releases had UHD editions. The three titles were also the three best selling new releases, 'Justice League', 'Ferdinand', and 'The Shape of Water'. So out of the top 10, five titles had UHD editions. Data provided by NPD (see graphics above) shows that UHD sales share was at 7.0% for this week, practically unchanged from last week. (Data gathered by the NPD differs from the other data here and is only for the top 50 best selling titles. The other data here are gathered by Media Play News Research). Despite selling the fewest copies compared to this week's other new releases, 'The Disaster Artist' actually had the best BD sales share of 73.19%. The week's top seller, 'Justice League', also did well with 70.48%. The next best was 'The Shape of Water' at 65.51%. 'Ferdinand' had the next best BD sales share, with 59.14%, just ahead of 'I, Tonya' with 58.05%. 'Call Me By Your Name' managed 55.39%. 'Justice League' was the only of the new releases to be made available on 3D, and it only recorded a BD3D sales share of 1.56%. For the UHD releases, 'The Shape of Water' had the best sales share at 12.18%, but it was only slightly higher than the 12.04% recorded by 'Justice League'. 'Ferdinand' managed 2.71% on UHD. The stats for the week ending March 18, 2017 are as follows. Some small adjustments to the data posted last year (based on more recent updates) has been made and is shown below. Blu-ray sales increased by $22.05m (up 61.2%), with unit sales up 47.3%. DVD sales decreased by $7.35m (down 11.8%), with unit sales down 10.6%. This meant $14.7 million more in combined revenue for the week. Blu-ray's market share increased from 36.63% to 51.37%. Blu-ray sales dropped a bit from the highs of the last two week, but was still hovering just under the $50 million mark. Weekly Blu-ray market share also dropped below 50%. Jumanji: Welcome to the Jungle was the headlining new release of the week, also easily the week's top seller and ahead of last week's number one, 'Justice League'. Another new release, Pitch Perfect 3 was in 3rd place, while Downsizing in 8th was the only remaining new release in the top 20. So not a week with a huge number of new releases, but big enough releases to ensure Blu-ray revenue was still at a relative high. This week's Ultra HD Blu-ray report: All three of this week's new releases in the top 20 had UHD editions. It was nearly a perfect run for UHD in the top 10, but Disney's 'Lady and the Tramp: Signature Collection' ruined the party for everyone. So out of the top 10, nine titles had UHD editions. Data provided by NPD (see graphics above) shows that UHD sales share was at 4.9% for this week, practically unchanged from last week. Of the three new releases, 'Downsizing' actually had the best BD sales share, with 60.38%. This was just ahead of the 57.74% earned by 'Jumanji: Welcome to the Jungle' and the 57.15% for 'Pitch Perfect 3'. On UHD, the ordering was different. 'Jumanji: Welcome to the Jungle' had the best UHD sales share, with 6.57%, compared to 4.59% for 'Pitch Perfect 3' and 4.25% for 'Downsizing'. The stats for the week ending March 25, 2017 are as follows. Some small adjustments to the data posted last year (based on more recent updates) has been made and is shown below. Blu-ray sales increased by $5.35m (up 12.3%), with unit sales up 9.8%. DVD sales decreased by $2.69m (down 4.5%), with unit sales down 4.8%. This meant $2.66 million more in combined revenue for the week. Blu-ray's market share increased from 42.14% to 46.13%. A huge week for Blu-ray thanks to a huge new release on Blu-ray - Star Wars: Episode VIII - The Last Jedi. It was also the pre-Easter week, which always gives a nice bump to disc sales. Suffice to say, it was easily the top selling title of the week, outselling 'Jumanji: Welcome to the Jungle' by 5-to-1. The only other new release in the top 20 was Acts of Violence, all the way in 20th place. The release of the latest Star Wars movies does give us a new point of comparison, since we can go back and see how the previous two Star Wars movies have done on Blu-ray. 'Rogue One', while not a "saga" movie, was also one of 2017's biggest releases and for the week it was released, Blu-ray revenue was at $67.62 million. This meant that 'The Last Jedi' easily beat 'Rogue One'. But a comparison with 'The Force Awakens' is probably more appropriate given 'The Last Jedi' is a direct sequel. 'The Force Awakens' was 2016's biggest release, and was in the top 10 for almost all of the year after release. For the week it was released, Blu-ray revenue was at a near record $93.40 million. This bests 'The Last Jedi' by more than 19%. While some of that is down to the decline in physical media sales, some of it is also down to the fact that 'The Last Jedi' was a smaller box office draw than 'The Force Awakens' (which is also not surprising given historical results for Star Wars sequels). But given that this week was also the pre-Easter bump, the figures for 'The Last Jedi' starts to look less impressive. This week's Ultra HD Blu-ray report: 'The Last Jedi' was available on UHD as mentioned only a sentence ago, but 'Acts of Violence' was not. So out of the top 10, eight titles had UHD editions. Data provided by NPD (see graphics above) shows that UHD sales share was at 8.8% for this week, the highest since January 20th (this was the week that 'Blade Runner 2049' was released, and it had a more impressive showing on UHD). 'Star Wars: Episode VIII - The Last Jedi' did fantastically on Blu-ray, earning a first week BD sales share of 80.03%. 'Acts of Violence' manged 39%. And now for the number everyone is waiting for (well, at least me anyway). On UHD, 'The Last Jedi' managed a first week UHD sales share of 14.81%, which is fairly impressive given the relatively low take up date of Ultra HD at the moment. The stats for the week ending April 1, 2017 are as follows. Some small adjustments to the data posted last year (based on more recent updates) has been made and is shown below. Not the fairest comparison between two weeks, since while last year's 'Fantastic Beasts and Where to Find Them' was also a big release, this year also happened to be the pre-Easter bump, which occurred during a different week last year. A rare "all green" week was therefore the result, as you can see below. Blu-ray sales increased by $22.97m (up 43.8%), with unit sales up 47.3%. DVD sales increased by $2.69m (up 4.8%), with unit sales up 7.2%. This meant $25.66 million more in combined revenue for the week. 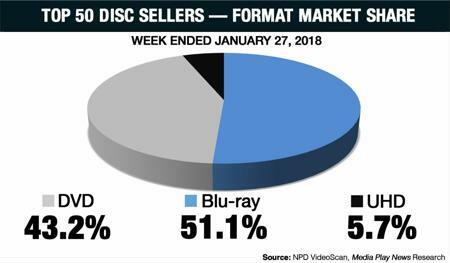 Blu-ray's market share increased from 46.38% to 54.27%. The NPD numbers reported by Media Play News are in unit sales, not revenue.